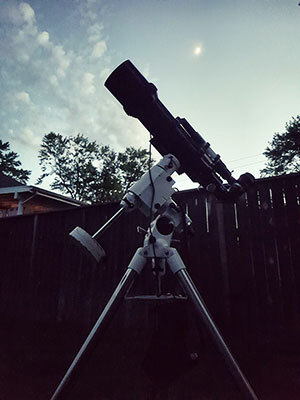 The hot nights of early summer astrophotography start late and end early. The warm temperatures at night make their presence known in my DSLR images in the form of noise. My latest deep sky project involves capturing data on NGC 6888 in H-Alpha with a DSLR. My highly portable astrophotography equipment allows me to move the entire rig around the yard based on my imaging target. This month, I have been getting a head start on summer Astro targets in Sagittarius such as the Omega Nebula. This means waiting until after midnight for my targets to rise high enough in the Southeast for a clear view. 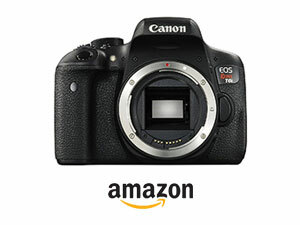 The Canon Rebel T3i is back in action! Despite the glow of the full moon and nightly “lows” of 27 degrees Celsius, I have continued to fire away at the night sky with my modified Canon DSLR. 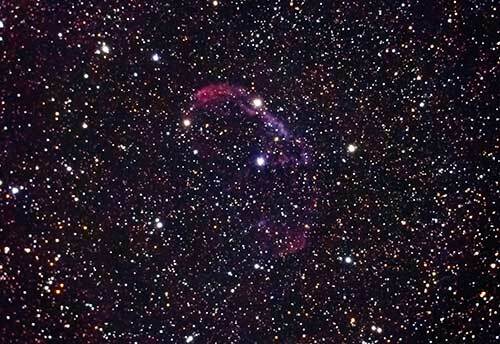 The subject of my most recent outings is NGC 6888 in Cygnus, the Crescent Nebula. With an Astronomik 12nm ha filter installed in my Canon 600D, I have captured over 3 hours worth of data on this striking emission nebula. My version of NGC 6888 is just starting to show the fainter details of the nebula. A deeper view like this one featured on Astronomy Magazine shows the delicate structure of this deep sky object. As I mentioned earlier, these were HOT nights. The temperature of the camera sensor was well over 30 Degrees Celcius for most of these images. This is quite a drastic contrast between the chilly images I captured last month using the icy ASI071MC-Cool. Captured over 2 nights using a modified Canon Rebel T3i/600D and Astronomik 12nm Ha Filter. 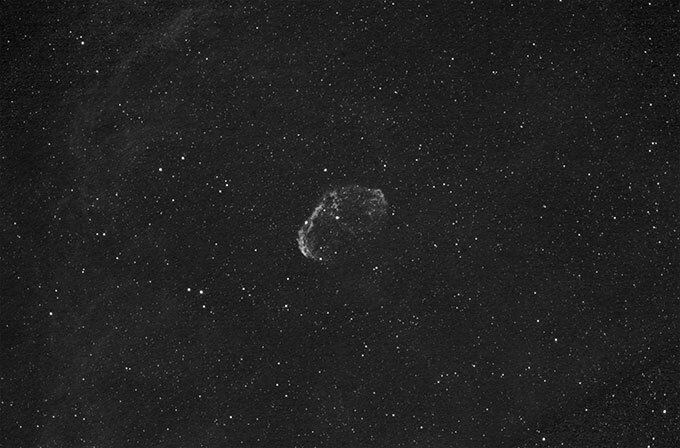 The Crescent Nebula is a notoriously difficult deep sky target from light polluted locations. Those shooting with a stock DSLR may be disappointed by the lack of structure captured using modest exposure lengths. Dark skies and hour of data are essential to produce a detailed portrait of NGC 6888. The video below has been sped up to show you the basic image processing steps I took in Adobe Photoshop. The image starts out as the RAW stacked file produced by Deep Sky Stacker – and is processed using levels, curves and specific actions from the Astronomy Tools Action Set. This Ha data will later be combined with upcoming true color RGB photos to produce an HaRGB composite in Photoshop. The hydrogen alpha details in the Crescent Nebula should help boost contrast in the final image. Later, I’ll use the SkyTech CLS-CCD light pollution filter to capture my broadband RGB data with the 600D. This filter does a great job at separating the nebula from the washed out background sky. To combat the thermal noise in my images, all I can do is limit the ISO sensitivity when shooting, and apply dark frames when stacking in Deep Sky Stacker. As expected, the RAW images out of the camera were incredibly noisy. Stacking multiple images and subtracting darks certainly helped, but it does not correct the issue completely. This is precisely why I am so interested in the capabilities of the Altair Astro Hypercam 183C, and how the Sony IM183 sensor will perform. The nebula looks gorgeous in Ha, but what about color? Below is an example of this target using a stock digital camera in full color. A member of the AstroBackyard Facebook page recently shared his image of the Crescent Nebula using a stock Sony Mirrorless digital camera. This is a great example of what to expect using a stock Sony A6300 for astrophotography. Zhonghua was able to pull out some impressive detail and color in this faint emission nebula with his stock A6300. This was captured through a Celestron NexStar 6SE telescope on a custom built wedge mount. The image above shows the Crescent nebula in true color, which I will be adding to my original H-Alpha image for an HaRGB composite. This way, I am able to show the nebula in true color, while benefitting from the additional contrast and detail in the hydrogen alpha wavelength. The constellation Cygnus, including NGC 6888 is a part of an asterism in the night sky known as the “Summer Triangle“. This triangle of stars consists of Altair, Deneb, and Vega. By mid-July, these imaging sessions will commence when the night has set in at about 10:30 pm. 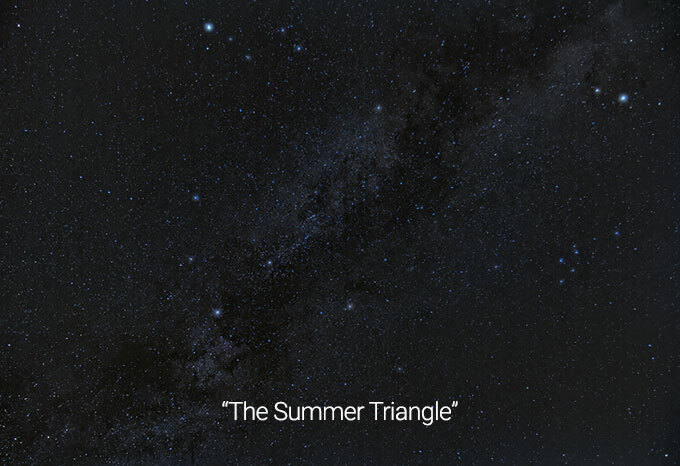 I enjoy watching the Summer Triangle continue its approach into my backyard viewing window night after night. Anything I photograph in this region is arguably the darkest and clearest area of the sky from my backyard. The photo above was shot through heavy light pollution using a wide angle camera lens. Through careful image processing, I am able to restore the details of this dense region of the Milky Way. 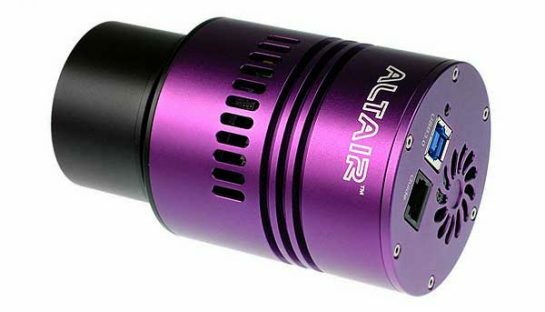 The highly anticipated Hypercam 183C astronomy camera will be arriving this week. Although the CMOS IMX183 sensor is not cooled via TEC-cooling, it benefits from an internal fan and a design that maximizes air flow. 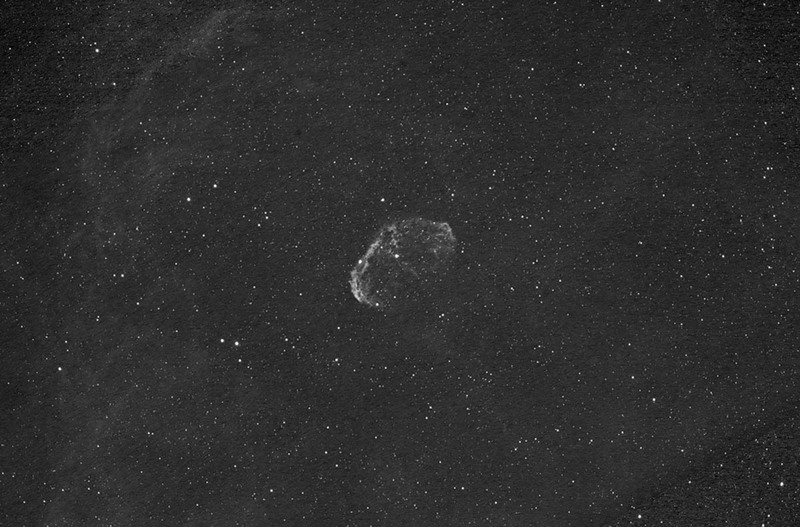 You can expect some color images of the Crescent Nebula using the 183C in the coming weeks. 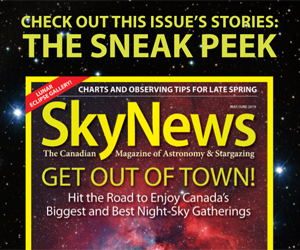 The team over at Ontario Telescope and Accessories have assured me that 183C is on the way! 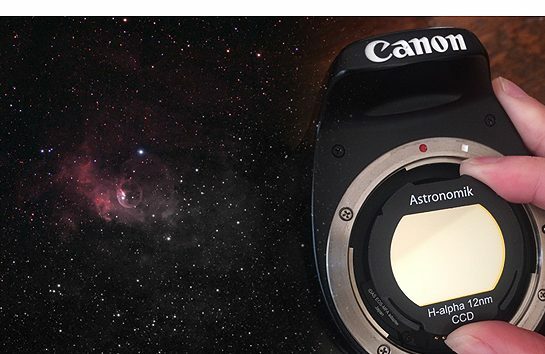 Please join the AstroBackyard Newsletter to stay up to date with my latest equipment reviews and imaging techniques. Hey Trevor. 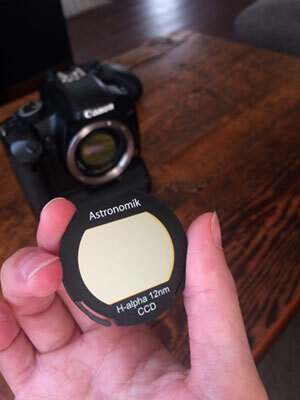 If understand, you are still using the T3i for H-Alpha but you will combine it with CCD color images? Sounds cool! I might purchase a Ha-filter at some point. Thanks for your posts, they have really helped. I using your flat frame subtraction method for the majority of the processing of my recent objects. I am finished with the Messier Big Dipper and Virgo Galaxies and am looking forward to imaging clusters and nebulae again.